Leading workshops is always fun, but we were particularly excited to be invited to take part in Parliament’s UK Vote 100 project – which celebrates 100 years of the passing of the Representation of the People Act in 1918. As theatremakers, it’s a rare and precious opportunity to work with younger people, to hopefully engage them, and to listen to their stories. Here’s a little background: playwright Hannah Davies and I are working on a new play – Maiden Speeches ­– inspired by women working in politics. The idea was conceived alongside York Theatre Royal and Pilot Theatre’s co-production of Everything is Possible, which told the story of the York Suffragette branch and their fight for the vote. One hundred years on since some women were given the vote, we are intrigued by the challenges women still face in the political arena. We are two women who were raised as part of the ‘lad-ette’ generation. ‘Feminism’ as a word was treated with suspicion when we were coming of age – or, most of the time, boredom. The fight had been fought – and won – surely? We had the right to vote, the right to go to university, the right to swill pints and wear Doc Martens and smoke in public. What did we, raised in the glorious and innocent 1990s really need to worry about? Well, quite a lot as it seems. There’s no getting around the whopping great gender pay gap we still have in this country – an eye-watering 18%. Which means that from 10th November each year, women in the UK are essentially working for free. The number of women currently in Parliament is at a record high – but still only 32%. Between 1918 and 2015 a total of 450 women were elected as MPS in the House of Commons. That’s fewer than the number of men (459) who sat in the 2015 Parliament. Only 26% of members in the House of Lords are women. That figure doesn’t improve when looking at local parliamentary figures: 32% of local authority councillors in England are women, as of 2013. In Scotland, 24% of councillors are women. Women hold 26% of council seats in Wales. In Northern Ireland 25% of councillors are women. Those figures get even worse when looking at racial diversity and sexual identity: only 52 MPs in Parliament are BAME, and only 45 openly identify as LGBQT. Parliament is still the domain of the straight, white male, and doesn’t come close to representing the diversity of its citizens. So, we began making a play. We had spent the last few weeks zooming around the country as part of our research, hanging out in the House of Commons, meeting with politicians and activists, and reading a lot of books. A Lot. And now – we were off to Lincoln to work with two groups of students as part of Vote 100’s Getting Selected workshops. We led two workshops based around the idea of finding your voice. Hannah began each session with a performance of her poem Maiden Speeches/Maiden Spaces to set the context – a brief history of female suffrage, dissent, a night spent in a broom cupboard and a call to arms for her audience to take a stand and speak out. And then it was time to give the students a chance to raise their voices. We worked on a storytelling session, asking pairs of students to construct stories based on their own life experiences – half of the group focusing on moments when they’d spoken up, and the other half recalling times they’d felt excluded from a group or a community or an event. In each pair, one person would be telling a story, the other listening. It was then up to the listening student to share their partner’s story with the rest of the group – a challenge for all concerned, as it’s just as hard to tell someone else’s version of events as it is to listen to your neighbor tell your story as if it’s their own. The exercise highlighted the importance of active listening, and prompted important discussions around advocacy and taking responsible ownership of other’s life narratives. The stories we heard were brave, detailed, and bold. Some were funny but they were all important. One student spoke of the time they had challenged their educational authority on LGBQT policy and had gone on to establish a presence for their school on a local LGBQT pride march. Another talked of the bravery they had needed to speak out on a family matter that was causing them concern. We heard stories from international and theological perspectives too – a story about student protests in Hong Kong, and one about the courage of making different religious choices from family and community. It was a real honour to hear snapshots of these students lives, passions and concerns. We finished up with leading the group through a writing exercise, offering them the chance to write their own political manifesto. First in private, and then as a group, we claimed the ideas and things that were important for us, our families and our communities. It was a real pleasure to spend this time with a group of young people and to hear their thoughts, anecdotes, dreams and concerns. We hope that our time with them made them think about the ways in which they can continue to own their stories while valuing the narratives of others, and that they will continue to find ways to share their ideas and politics, actively engaging in all the important personal and political dialogues that will arise throughout their lives. 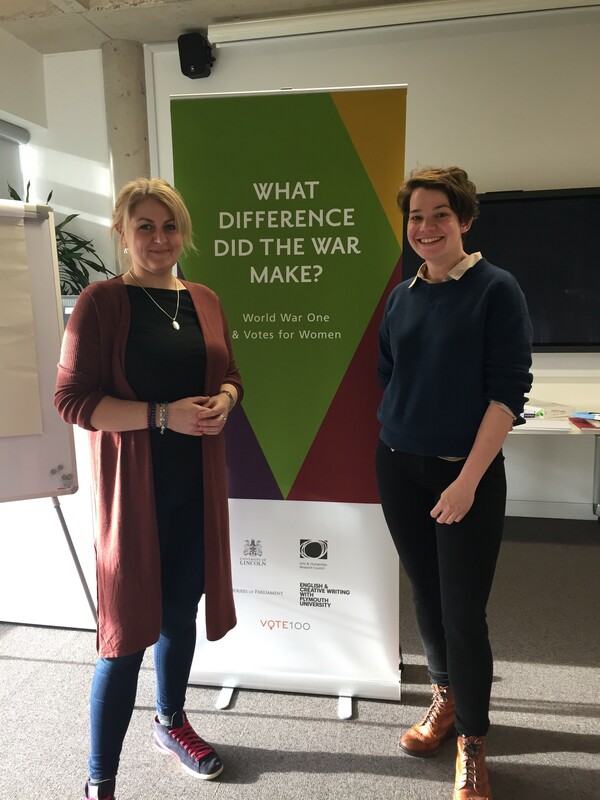 The workshop sessions and discussion at Lincoln formed the second event in a wider project funded by the Arts and Humanities Research Council, What Difference did the War make? World War One and Votes for Women. The project involves academics from the University of Lincoln, the University of Plymouth and Parliament’s Vote 100 project, and builds on previous research exploring the links between the ongoing wartime suffrage campaign and women’s votes.